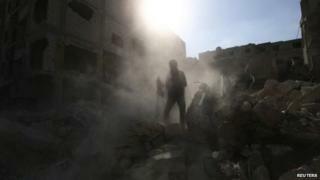 Syria civil war: Is it too late for a peace deal? On the fourth anniversary of the Syrian civil war, controversial comments by US Secretary of State John Kerry have put the focus back on Washington's lack of a clear strategy. In an interview with CBS on Sunday, Mr Kerry was asked whether he would be willing to negotiate with Syrian President Bashar al-Assad. "We have to negotiate in the end," he answered, adding that had always been an option within a broader peace process that started in Geneva in 2012. Mr Kerry's words were interpreted as a new willingness on the part of the US to negotiate directly with Assad. The comments drew widespread condemnation from US allies who support the Syrian opposition and caused consternation among Syrian activists. The state department quickly insisted there was no policy change, with a deputy spokesperson tweeting: "John Kerry repeated long-standing policy that we need negotiated process w/regime at table. There's no future for Assad in Syria." But Mr Kerry's answer also revealed something about current thinking within the administration - and the complex calculations involved. On Friday, the CIA chief John Brennan warned about another player in the Syrian conflict. He said the US was worried by the prospect of the Islamic State (IS) taking control of Syria if the Assad government collapsed. "The last thing we want to do is allow them to march into Damascus," he told an event in Washington DC. "That's why it's important to bolster those forces within the Syrian opposition that are not extremists." A Pentagon programme to train moderate rebels will start in the coming weeks at four sites in the region. Some groups that make up the southern front are only 35km away from Damascus and are still holding on to territory despite recent onslaughts by Syrian government forces. But opposition activists say the US is reluctant to give the rebels the support that would enable them to seriously threaten the capital. That kind of leverage is what could bring Assad to the table. "The US got scared of the military success of the southern front, they don't want Assad to fall now, because of Isis [IS]," said Maan Abdul Salam, a civilian opposition activist connected to the southern front. Image caption Bashar al-Assad said any solution would be "based on the will of the Syrian people"
Diplomats in Washington from various capitals quip that the only thing the administration has been consistent about in its Syria strategy is not having one. The White House's key focus now is fighting IS, but air strikes are focused mostly inside Iraq. Bayan Sami Abdul Rahman, the US representative for the Kurdish Regional Government, said the narrow focus undermines the strategy against IS. "If we really want to talk about defeating IS, we need a Syria strategy," Ms Abdul Raham recently told reporters. "We can push [IS] out of Iraq, but they'll have a home in Syria that acts like their nerve centre, with oil supplies and command and control." In conversations with US officials and Washington analysts, the word containment comes up more and more when discussing Syria. But outside of Washington, there are deep concerns this will turn Syria into a failed state, a Somalia-like scenario on the Mediterranean. "Americans see IS as an Iraq problem. For Europe, it's a Syria crisis," a Western diplomat told me. "For the Americans, if they push IS into Syria, the crisis is over. For others it isn't, because of the problem of foreign fighters." If the only strategy for Syria is a negotiated solution, then four years of war and the slow disintegration of what's left of Syrian state institutions have also undermined that possibility. Analysts say the Syrian armed forces are not a spent force yet, but they have been deeply transformed as an institution by the conflict. "A necessary condition of Assad's survival was the transformation of his military into an anti-insurgency force and in parallel the 'militia-fication' of the regime," says Emile Hokayem of the International Institute for Strategic Studies. "Assuming he wants to negotiate, which he does not, Assad today has politically a smaller margin of manoeuvre than earlier because he owes his survival to an array of militias whose interests are not fully aligned with his," he added. A lot of the power also rests with Tehran, his key backer. "Assad is too weak to even win against the jihadists," the Western diplomat told me. Mr Abdul Salam, the activist, warned that while many rebels felt they could still work with the army, dynamics on the ground were changing. "Syrian government forces will be seen as an occupying force with mercenaries and Iranian fighters, and it will become difficult to have reconciliation efforts on the ground between the fighters," he said. And such efforts are a key element underpinning any political settlement.